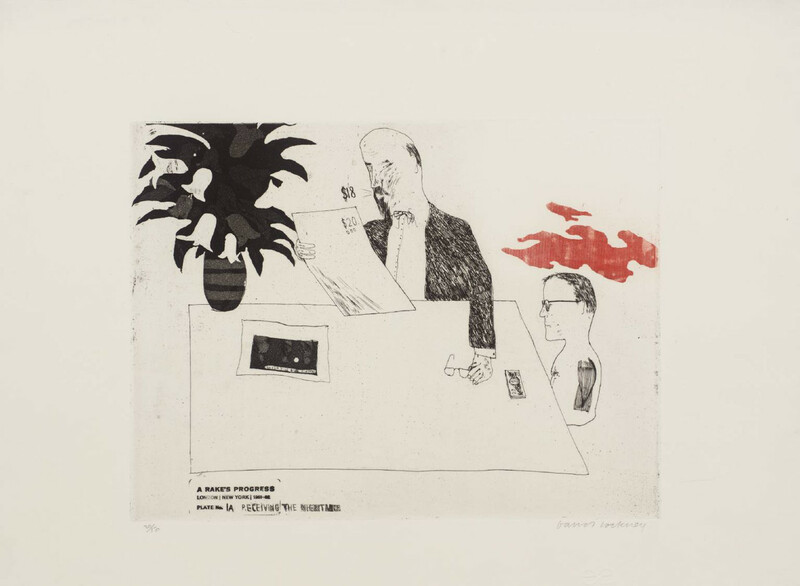 In the second etching of Hockney's A Rake's Progress, little Tim Rakewell aka David Hockney receives a fat check for $20 from The Big Curator of New York's Museum of Modern Art. The Big Curator is buying two etchings, and then will help sell a bunch more and Tim is suddenly in the money (around $200). In the original A Rake's Progress by William Hogarth, Tom Rakewell inherits and then squanders his merchant father's fortune. Along the way he abandons his pregnant fiance, marries an elderly rich hag, lands in debtor prison, and then ends up in an insane asylum. There's no inheritance for Hockney's rake Tim but $200 is $200. For a starving artist in the 1960s, its good money. What will Tim do with the loot?